Elmira Old Order Mennonite Church in Elmira, Ontario in July 1947. Source: Mennonite Community Photograph Collection, The Congregation (HM4-134 Box 1 photo 011.4-3). The Elmira Mennonite meetinghouse is located on the north side of Church Street on the western edge of town, next to the Elmira Mennonite Church. It originated in 1854 when the town was still very small. Most Mennonite families in the area were second or third generation descendants of immigrants from Pennsylvania who had settled in the northern end of Waterloo Township and into Woolwich Township. 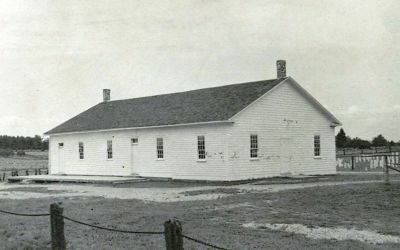 From its beginning until about 1930 services were held every four weeks; since 1959 services have been held in the meetinghouse every week. During the contentions of the 1880s almost all Mennonites in the immediate geographic area affiliated with the Old Order. Those who desired affiliation with the Mennonite Conference of Ontario had to travel south to Conestogo (St. Jacobs) or, somewhat later, to North Woolwich (Floradale). Not until 1924 did the Conference Mennonites build a church in Elmira, as a branch of the Floradale Mennonite Church. Although the Old Order Mennonites had some hesitancy about another church immediately next door, they agreed to share the cemetery with the new group, an arrangement that remained in place in 2003. During the 1920s a few members switched to the conference church largely for use of the telephone and later the car. By 1930 some Old Order members still desired use of the telephone and car, but didn't want to abandon other Old Order Mennonite principles. About this time the Old Order church in Markham, Ontario affiliated with the Weaverland Conference in Lancaster Conference, Pennsylvania which had emerged in a 1927 split over use of the automobile. During the 1930s some families in north Waterloo County bought cars and began to travel to the Markham group in order to receive communion. By the end of the 1930s this group had become large enough to develop a fellowship in Woolwich Township. Also during the 1930s there was a revival movement in the community that drew some Mennonites and influenced others. In June 1939 there was a division in the Elmira Mennonite meetinghouse. Bishop Jesse Bauman sided with the automobile group. Since that time the meetinghouse has been shared by the Old Order and Markham-Waterloo Mennonite Conference congregations. Later in 1939 about one-third of the Markham-Waterloo group withdrew because change within the group was not quite as extensive as they desired. Most of this group then joined the Elmira Mennonite Church or sister churches the following year. The meetinghouse and the property have been enlarged several times over the years. The meetinghouse was almost entirely rebuilt in 1975, and the property again enlarged in the early 1990s. The Markham-Waterloo congregation has had a membership of 175-225 most of the time since 1939, and was at the lower end of that number in 2003. The area served by the meetinghouse was smaller in 2003 than in 1939. The Old Order membership was similar, but was at the high end in 2003. The geographic area of the West Woolwich Old Order congregation, as it is known, is also smaller than it was in the past. The language of worship for the Markham-Waterloo congregation is English. The transition from German occurred in the 1940s. All ministerial leadership are chosen by lot for unlimited terms. They are not paid for their service. Frey, Aden. "The Markham-Waterloo Conference of Ontario." Research paper, Conrad Grebel College, 1972, 38 pp. Mennonites in Canada collection, Mennonite Archives of Ontario, "70-Markham-Waterloo." Frey, Clare. "Elmira Mennonite Meetinghouse (Elmira, Ontario, Canada)." Global Anabaptist Mennonite Encyclopedia Online. October 2003. Web. 24 Apr 2019. http://gameo.org/index.php?title=Elmira_Mennonite_Meetinghouse_(Elmira,_Ontario,_Canada)&oldid=116917. Frey, Clare. (October 2003). Elmira Mennonite Meetinghouse (Elmira, Ontario, Canada). Global Anabaptist Mennonite Encyclopedia Online. Retrieved 24 April 2019, from http://gameo.org/index.php?title=Elmira_Mennonite_Meetinghouse_(Elmira,_Ontario,_Canada)&oldid=116917. This page was last modified on 29 March 2014, at 23:06.